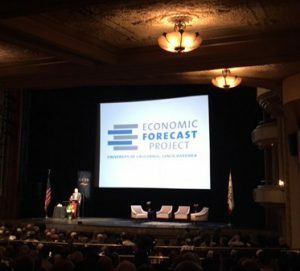 The Santa Barbara County Economic Summit at the Granada Theatre on May 5. The U.S. is unlikely to experience negative interest rates, Federal Reserve Bank of St. Louis President and CEO James Bullard said at the UC Santa Barbara Economic Summit at the Granada Theater on May 5. He said U.S. labor market strength justifies the Fed’s vision of gradually rising rates and inflation near the 2 percent target. Bullard said market skepticism about the economy and Fed policy may not be the correct view. While Bullard portrayed positive trends in the labor market, he was cautious about slow GDP growth and inflation prospects. It is likely that the labor market is well beyond a reasonable conception of full employment, Bullard said. He pointed to job openings per available worker that are at a cyclical low, unemployment insurance claims are at historical lows and an “impressive” labor market as measured by payroll employment growth. “Labor market performance looks great,” Bullard said. 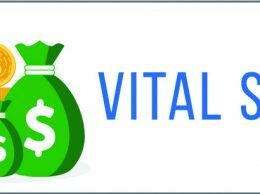 Peter Rupert, executive director of the UCSB Economic Forecast Project, offered a similar positive take on the Santa Barbara County labor market. But he was tempered in his forecast due to the potential negative consequences posed by minimum wage hikes. While major exporters and manufacturers recently took a hit, the effects of the strong dollar appear to be waning and financial stress has fallen, Bullard said. Yet, real GDP is growing below a trend pace of 2 percent, which concerns Bullard given the strong labor market data. As for inflation, markets can be interpreted as expecting just 1.41 percent personal consumption expenditure inflation over the next 10 years, he said. “This is a worrisome development,” Bullard said.